Final Fantasy Type-0 was released in Japan this past Thursday—two days later than in America. But like many of you, I was more interested in the Final Fantasy XV demo than Type-0 itself. I didn't exactly enjoy the Type-0 experience when the game was originally released, to say the least—though there were more than a few things about the game that I did like out of all the things I did not. While I was tentatively open to playing it again on the PlayStation 4, after some thought, I decided I really only wanted Type-0 for the Final Fantasy XV demo. So when I found out that the demo had Japanese with English text and was being distributed via download code (instead of being physically on the Type-0 Blu-ray), the choice seemed clear. 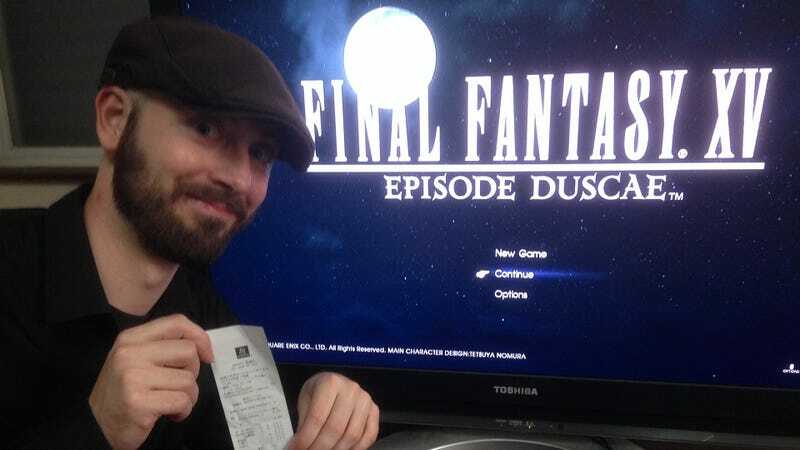 I went out, bought Type-0 from my local game store, came home, downloaded the Final Fantasy XV demo, and, less than an hour later, sold it back to the game store. The clerk didn't even bat an eye. In short, I "rented" the game and "bought" the demo. In all, the net cost of the demo was 2150 yen (about $18)—a bargain in my opinion. And if you think it's ridiculous to pay anything for a demo, look at it this way: In Japan, a movie in the theater costs about 1800 yen (about $15) for two hours of fun. I have gotten more than two hours of fun out of the Final Fantasy XV demo already and—thanks to people figuring out how to break the demo and explore more of the world—it looks like I have several more hours of good times ahead of me. Not a bad deal, if you ask me. Besides, I paid $29.99 for Metal Gear Solid V: Ground Zeroes, so it's not like paying for demos (even awesome ones) is anything new. Surely, I'm not alone, am I?